A holy guardian angel meets her match in mid-20th century L.A.
A guardian angel looms with outstretched arms over the exhibition devoted to enigmatic 20th century artist Cameron in MOCA’s offshoot gallery at the Pacific Design Center. 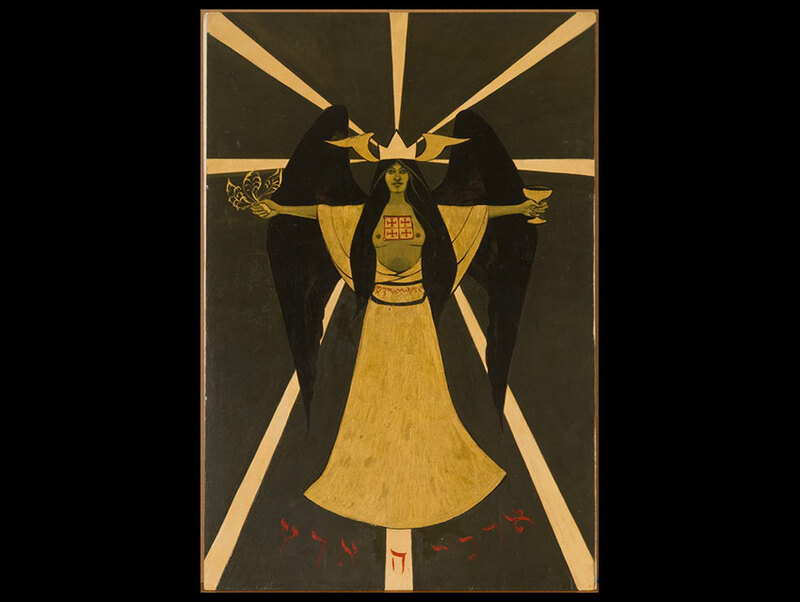 Flanked on both sides by secondary angel portraits that direct our attention to this central figure, Cameron’s Holy Guardian Angel is derived from a mystical concept propounded by the popular English occultist Aleister Crowley. The mysterious Hebrew-lettered bilingual phrase “Archeh Ha’aretz” at the bottom of the painting nods to both the Kabbalistic and Hellenic origins of Crowley’s spiritual divinings. Though she never personally communicated with Crowley, Marjorie Cameron Parsons (who used her maiden surname as her public moniker) and her husband Jack Parsons, a rocket scientist who helped found NASA’s Jet Propulsion Laboratory in Altadena, were both acolytes of the Thelemic religion that Crowley had created. In Crowley’s theology every person has an appointed Holy Guardian Angel watching over them and summoning our personal guardian angels through a process of black magic called “Knowledge and Conversation” is the essential step in discovering our highest selves. Born and raised in Iowa, Cameron spent her early adult life in Los Angeles, where she had originally moved to take a job with the U.S. Navy during World War II. In 1946 she attended a wild party at Parsons’s Pasadena mansion, and the two were married not long after. Parsons was convinced that his new wife was sent to him by the goddess Babalon, and Cameron came to believe that Babalon’s spirit resided uniquely in her. She began painting around the same time she met Parsons, and much of her work was devoted to the esoteric subjects she encountered through his introduction. Among her early projects was a series of ink drawings illustrating his book of poems Songs for the Witch Woman, which MOCA has also taken as the name of this exhibition. After Parsons died in 1952 at the age of 38, Cameron’s artistic career continued to flourish along with her interest in mythology, astrology, and the occult. The nearly 100 pieces in MOCA’s current show feature an array of angels and demons, shamans and witches, fossilized skeletons and animistic spirits, UFOs and drug-induced visions. The exhibition notes also highlight Cameron’s close personal connections to some of the most prominent personalities of the mid-century L.A. counterculture including filmmakers Kenneth Anger, Dennis Hopper, Maya Deren, and Curtis Harrington as well as artists Ed Kienholz, Wallace Berman, and George Herms. Cameron left Los Angeles in the late 1950s after her mildly risqué “peyote vision” drawing prompted the LAPD’s vice squad to shut down the gallery show where it was being displayed. Eventually, though, she returned to West Hollywood where she resided until her death in 1995.